The site of curatorial production has been expanded to include the space of the Internet and the focus of curatorial attention has been extended from the object to processes to dynamic network systems. As a result, curatorial work has become more widely distributed between multiple agents, including technological networks and software. This upgraded ‘operating system’ of art presents new possibilities of online curating that is collective and distributed – even to the extreme of a self-organising system that curates itself. The curator is part of this entire system but not central to it. The subtitle of the book makes reference to the essay ‘The Work of Culture in the Age of Cybernetic Systems’ (1988), in which Bill Nichols considered how cybernetics transformed cultural production. He emphasised the shift from mechanical reproduction (symbolised by the camera) to that of cybernetic systems (symbolised by the computer) in relation to the political economy, and pointed to contradictory tendencies inherent in these systems: ‘the negative, currently dominant, tendency toward control, and the positive, more latent potential toward collectivity’. The book continues this general line of inquiry in relation to curating, and extends it by considering how power relations and control are expressed in the context of network systems and immateriality. The DATA browser series presents critical texts that explore issues at the intersection of culture and technology. This volume is produced in association with Arts Council England and University of Plymouth. Autonomedia is an autonomous zone for arts radicals in both old and new media. They publish books on radical media, politics and the arts that seek to transcend party lines, bottom lines and straight lines. They also maintain the Interactivist Info Exchange, an online forum for discourse and debate on themes relevant to the books they publish. Dr Geoff Cox is an occasional artist and projects organiser as well as currently lecturer at the University of Plymouth, UK, and Transart Institute (Donau University, Krems, Austria). He has a research interest in software culture expressed in various critical writings and projects, such as the co-curated touring exhibition ‘Generator’ (2002/03) and his PhD thesis ‘Antithesis: The Dialectics of Software Art’ (2006). He co-edited ‘Economising Culture’, ‘Engineering Culture’ and ‘Creating Insecurity’ as part of the DATA browser series (Autonomedia 2004/05/09). he is also associate curator (online) at Arnolfini, Bristol, UK. Dr Joasia Krysa is an independent curator and lecturer in Art and Technology at the University of Plymouth (UK), where she is also a founding member of Art and Social Technologies Research, part of the AZTEC (Art Science Technology) Consortium. Amongst many curatorial and advisory appointments she is the founder of the KURATOR project, Member of the Council of Management for WRO Art Center Foundation (Poland), co-manages the Curatorial Network (with Arts Council England, UK) and frequently serves on international jury panels including most recently ARCO Media Art Awards 2007, 2008 and 2009, Madrid and SHARE Festival Prize 2007, Turin. 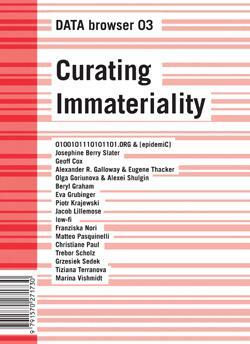 As part of the DATA browser series, she co-edited ‘Economising Culture’ (2004), ‘Engineering Culture’ (2005), and edited ‘Curating Immateriality’ (2006). Dr Anya Lewin is an artist and a Lecturer in Fine Art at the University of Plymouth, UK. Her current projects include ‘Art Tourist Commissions’ and ‘Full Lessons about Less Meaning’ made during a residency at InterSpace in Sofia, Bulgaria as well as ‘Oral History: A Story of Cinema, Dentistry and Exile’ with Picture This, Bristol. She co-edited ‘Economising Culture’ as part of the DATA browser series (Autonomedia 2004). Dr. Malcolm Miles is Profesor of Cultural Theory at the University of Plymouth, UK, where he convenes the Critical Spaces Research Centre and co-ordinates the research methods programme for doctoral students in the Faculty of Arts. He is author of ‘Cities & Cultures’ (2007), ‘Urban Avant-Gardes’ (2004) and ‘Art Space & the City’ (1997), co- author of ‘Consuming Cities’ (2004, with Steven Miles), and co-editor of the ‘City Cultures Reader’ (2nd edition 2003, with Tim Hall and Iain Borden). His next authored book will be ‘Urban Utopias’ (2008). He is co-Editor for the Routledge series, ‘Critical Introductions to Urbanism’, with John Rennie Short (University of Maryland). He has contributed to Space & Culture, Urban Studies, and Parallax, among other journals. His current research is in a field triangulated by contemporary art, critical theory, and aspects of the social sciences dealing with social transformation. Hugo de Rijke is a Lecturer in Media Industries at the School of Computing, Communications and Electronics; and also Lecturer in Law at the School of Sociology, Politics and Law, at the University of Plymouth, UK. He holds a BA in Law and Literature from the University of Keele, and an MA in English and American Cultural Studies from the University of Exeter. He has worked as a publisher for several legal publishing houses and commissioned numerous publications, whilst dealing with media law issues. He is also a qualified barrister and practised for a number of years, conducting jury trials and other civil matters. His current research interests include digital art copyright and obscenity; and the law relating to anti-corporate/ subversive Internet activity.